La Torre, A. (2016). Retinal Differentiation of Mouse Embryonic Stem Cells. Bio-protocol 6(13): e1851. DOI: 10.21769/BioProtoc.1851. Groundbreaking studies from Dr. Yoshiki Sasai’s laboratory have recently introduced novel methods to differentiate mouse and human Embryonic Stem Cells (mESCs and hESCs) into organ-like 3D structures aimed to recapitulate developmental organogenesis programs (Eiraku et al., 2011; Eiraku and Sasai, 2012; Nakano et al., 2012; Kamiya et al., 2011). We took advantage of this method to optimize a 3D protocol to efficiently generate retinal progenitor cells and subsequently retinal neurons in vitro. This culture system provides an invaluable platform both to study early developmental processes and to obtain retinal neurons for transplantation approaches. The protocol described here has been successfully applied to several mouse ESC (including the R1, WD44 and G4 cell lines) and mouse induced-Pluripotent Stem Cell (iPSCs) lines. Thaw an aliquot of Growth Factor Reduced-Matrigel by submerging the tube in ice for 1 h.
Dilute the Matrigel 1:50 in cold MEF medium and transfer the media and the Matrigel to a TC dish. For 6-well plates, we use 1 ml/well and 7 ml for 10 cm plates. Incubate at 37 ºC for at least 1 h.
Note: Because Matrigel solidifies at warm temperatures, it should be kept on ice at all times and we recommend using pre-cooled pipet tips. mESCs are plated on a 10 cm dish pre-coated with Growth Factor Reduced-Matrigel, in LIF + 2i medium. mESCs are next incubated in a 5% CO2 incubator at 37 ºC until passage or retinal differentiation. Medium is changed every other day. Note: Special attention should be taken to avoid overconfluency of mESCs in maintenance cultures as it might result in detrimental differentiation of the cells. Remove the media from a 50% confluent plate of undifferentiated mESC (at least four passages off feeder layers, Figure1) and add TrypLE Trypsin replacement to the cells. Place the cells back in the incubator for 3-5 min until the mESCs colonies start to lift. Since TrypLE Trypsin replacement is not inhibited by the serum in the media, this method does not require a pre-wash with PBS. Add 5 ml of MEF media to the plate and gently lift off the cells using a glass Pasteur pipette. Observe that the cells are removed from the plate and pipette up and down to achieve a single cell suspension being careful to avoid bubbles. Figure 1. Typical morphologies of undifferentiated mESCs (Day 0). Feeder-free undifferentiated R1 mESCs (originally generated by Andras Nagy) are shown. Scale bars: 500 μm (A) and 250 μm (B). mESC cells are pelleted at 190 x g for 5 min. Carefully disperse the pellet using 5 ml of Retinal Differentiation medium (RD medium). Count the cell density using a hemocytometer (Neubauer chamber) or equivalent method. Plate 3,000 cells per 100 μl in a 96-well low attachment plate (100 μl/well) in RD medium. Cell aggregates (Embryoid Bodies) should form in less than 12 h. The day on which the culture is started is designated as Day 0. 24 h later (Day 1), add Growth Factor Reduced-Matrigel to a final concentration of 2% (vol/vol). The lot-to-lot variability in commercial Matrigel products can change the efficiency of retinal induction; we preferentially use one of relatively high concentration (> 9.5 mg/ml). We recommend diluting the Matrigel 1:10 in cold RD medium and add 20 μl of the dilution/well. On Day 3 a clear layer of neuroepithelial cells is apparent (Figure 2). Note: Different cell lines might grow at different rates and consequently the initial number of cells per well might need to be adjusted. We found that for most of the lines tested 3,000-5,000 cells/well was the optimal cell density. Figure 2. Typical morphologies of embryoid bodies at the different differentiation stages. R1 mESCs were differentiated using the method described here. Around each EB (embryoid body) a clear neuroepithelial layer develops from Day 3 (D-F), and from Day 5 this layer is conspicuous (G-K), optic vesicle and optic cup-like structures are apparent from day 7-8 (L-O). Scale bars: 150 μm. Note: Retinal Pigmented Epithelium (RPE) cells are observed after Day 13 (red arrows in O and P). On Day 7, the embryoid bodies (EBs) are transferred to 6-well low-attachment plates in Tom’s medium supplemented with B27 and N2 to promote neuronal differentiation. From Day 7 medium should be changed every other day. From Day 15 onwards, EBs are maintained in Tom’s medium. Rhodopsin+ Rod photoreceptors are detected from Day 24 and after Day 35, the EBs exhibit all the layers of the mature retina. This protocol was originally published as part of: La Torre et al. (2015). The author wishes to thank all present and past members of the Reh and Bermingham-McDonogh laboratories for many helpful discussions. Special thanks to Tom Reh and Akina Hoshino for invaluable help and advice, and NIH 1 PO1 GM081619 and the imaging core of the Vision Core Grant to the University of Washington, P30EY01730 (PI: Reh). Eiraku, M., Takata, N., Ishibashi, H., Kawada, M., Sakakura, E., Okuda, S., Sekiguchi, K., Adachi, T. and Sasai, Y. (2011). Self-organizing optic-cup morphogenesis in three-dimensional culture. Nature 472(7341): 51-56. Eiraku, M. and Sasai, Y. (2012). Mouse embryonic stem cell culture for generation of three-dimensional retinal and cortical tissues. Nat Protoc 7(1): 69-79. Kamiya, D., Banno, S., Sasai, N., Ohgushi, M., Inomata, H., Watanabe, K., Kawada, M., Yakura, R., Kiyonari, H., Nakao, K., Jakt, L. M., Nishikawa, S. and Sasai, Y. (2011). Intrinsic transition of embryonic stem-cell differentiation into neural progenitors. Nature 470(7335): 503-509. Nakano, T., Ando, S., Takata, N., Kawada, M., Muguruma, K., Sekiguchi, K., Saito, K., Yonemura, S., Eiraku, M. and Sasai, Y. (2012). Self-formation of optic cups and storable stratified neural retina from human ESCs. Cell Stem Cell 10(6): 771-785. How to cite: La Torre, A. (2016). Retinal Differentiation of Mouse Embryonic Stem Cells. Bio-protocol 6(13): e1851. DOI: 10.21769/BioProtoc.1851. "From Day 7 medium should be changed every other day". When you change the medium, you change all or half? there is the risk when you remove the medium to take away also organoids? How can we do? P.s. 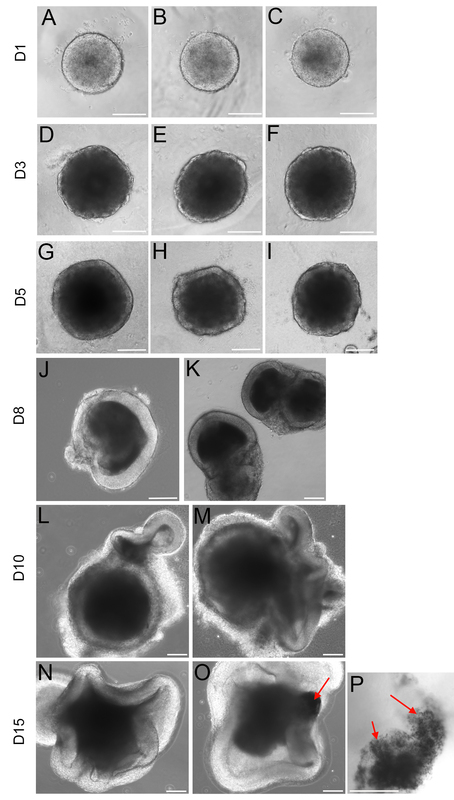 we are to D6 and organoids are amazing. Hi again! You can change only half the medium. After day 15 or so, the EBs are bigger and then, if you notice that the medium gets acidic quickly, you can do a full media change. The easiest way is to tilt the plate so all the EBs move to the bottom of one side and slowly (don't use suction! only a pipette) remove the media, add fresh media and you are done. Auguri! Dear Dr. La Torre, I started to apply its exhaustive protocol yestarday (for the first time). I used R1 cell Line to generate EBs. My questions concern on the transfer of the EBs from 96 well to 6 well. how many EBs can i transfer in each well? What could I use to transfer ebs? pasteur? 1000 filter tips? Dear De La Torre, I started to apply its exhaustive protocol yestarday (dir the forse time). I used R1 cell Line ti generete EBs. My questions concern on the transfer of the EBs from from 96 dell to 6 well. how many EBs can i transfer in each well? What could I use to transfer ebs? pasteur? 1000 filter tips? Hi! We normally use a pipet with a 1000 tip. A pasteur will work too since it's big enough so the EBs are not broken during the transfer. From a 96 well plate, we move them to 3-4 wells of a 6 well plate. Therefore, we plate about 24-30 EBs per well but you don't need to count, just distribute them more or less evenly. Good luck with your cells! PS: I really want to learn Italian! Dear Dr. La Torre, thanks so much for your feedback! Today is D2 of EBs and everything seems ok! P.S. we could share our knowledge: I in Italian and you in retinal differentiation :) ! hi, we have tried this protocol several times but the cells seemed already dead on D7. we haven't change the medium from D1-D7, since the protocol did not mention how to change it? Is that the reason? Do you change the medium from D1-D7? How ? You do NOT change media during the first few days. When are your cells dying? and also, what cell line are you using? you could try to move them to the bigger plates earlier (day 4-6) if your cell line tends to grow very quickly and that might be the issue. I hope this helps but don't hesitate to email me if you need any further info. Good luck! I thought perhaps I should further clarify: if (a) your EBs develop well during the first few days (i.e. on Day 1 you see a well-defined ball of cells with smooth edges and on day 3 there is a clear epithelium developing all around the EB) and the media is changing color to yellowish before day 7, I would move the cells earlier to the 6 well plates. If (b) the EBs don't form well, they become darker, you don't see smooth edges from day1 or the neuroepithelium is not clearly developing from day3, then probably your dissociation is too aggressive and I would try to reduce the time for the enzymatic dissociation. Thank you so much for the reply! We use E14 cell line. The EBs seem develop well on Day1 but we do not see clear edge on Day3. Then the EBs became darker and on Day7 we do not see any live cells. If we move the EBs to 6 well plate on Day4, do we need to add matrigel in the medium? No need for more matrigel. The matrigel is only needed very early to promote polarization and trigger the right developmental program.